“So, where does that leave you,” I asked. In the beginning, most companies organize the work around people and their abilities. As the company grows, an inevitable transition must take place. At some point, we have to organize the people around the work. This looks like a people problem. This is a structural problem. If you think your organization is people dependent, where work is organized around the people we have, what steps would it take to transform into a system dependent organization? It starts with the simple documentation of processes and roles. That’s the first step to prevent becoming hostage to an underperformer. 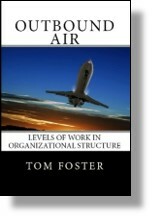 This entry was posted in Organization Structure and tagged organizational structure on March 30, 2018 by Tom Foster. Working with various companies, I’ve found that in many cases the transference of knowledge is tribal and in part why so many under-performers stay in an organization. Many owners love the idea of documenting processes and procedures yet drastically underestimate the time spent going thru the documentation process. This generally results in the abandonment of the documentation process or a rather haphazard approach, which also results in failure. What resources are available to drive home the value and importance of the documentation process that can be shared with stakeholders as well as team members?